I hear many writers talk about the hurt they feel when friends and family don't support or cheer on their accomplishments-- whether it is a published essay, a new book, a special blog feature, etc.. I have to say, I get it. I have experienced the disappointment when a close friend or family member has not supported my endeavors. I tend to reason it this way: If he/she sent me an email that they got a new job, I would of course write back with a congratulations-- whether or not I even understood the new job. After all, if they are happy and excited, then I am happy for them! Here's why I think it hurts us artistic folks more: we risk rejection every single day. We put ourselves in a vulnerable position by creating products from our minds and hearts for others to consume. Of course we know not everyone will like what we put out. We know that not even all of our friends and family will like what we create. That's okay. There are better writers than me, or a more skilled painter than the next. Most of us don't do it for others anyway. However, in risking rejection daily from strangers, I think many of us do hope to find solace and support from those close to us, even just a simple "congrats"-- whether or not they personally love or purchase a piece. 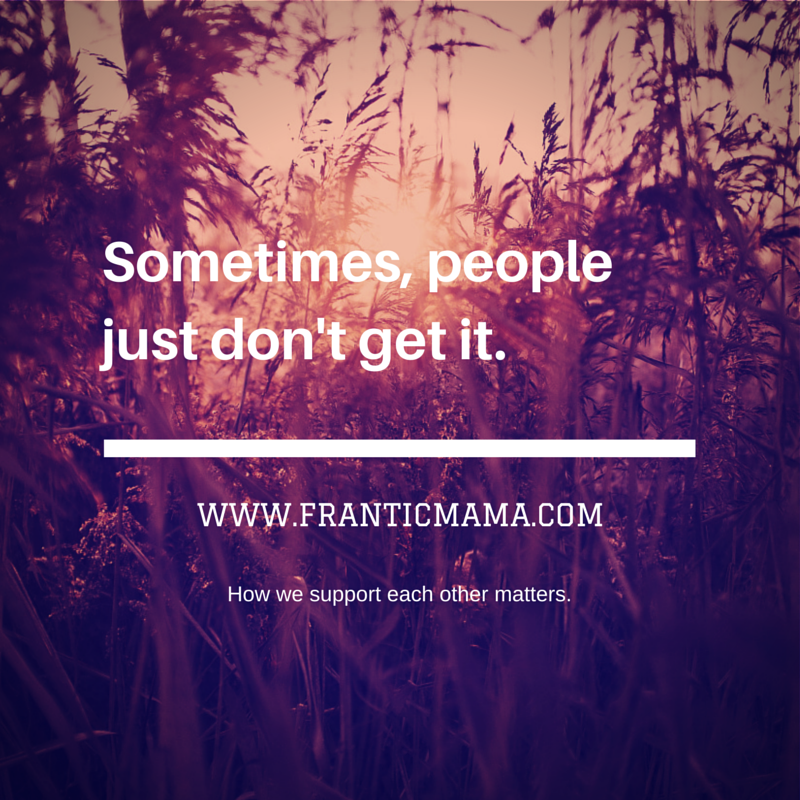 When that support doesn't come, when we don't feel that from those close to us, it stings. It can even put a damper on our triumphs, regardless of how hard we try to shrug it off. At least, this is all true for me. People are busy. Everyone's lives are complicated. I know this. There are a million reasons why your best high school friend or your favorite aunt have been too busy to send you a note of support or to even simply "like" an important post on Facebook. As much as I try to remember that, it can be hard to swallow, especially when I'm feeling vulnerable. To end on a positive note: I am always touched when a casual acquaintance, a distant friend or relative, or even a stranger shows up-- emotionally, electronically, etc.-- to support my work. It means the world and it never goes without appreciation. Writers/artists, can you relate to this? Or, if you aren't an artist/writer, do you feel the importance of acknowledging an artist friend's successes? Thank you for writing about this! I also think that they just don't get it. They see your email pop into their box and it's like "oh she's written again. I'll get to it when I get to it." Whereas folks who keenly follow your blog are like "yay! She's written again! Cool. Wonder what it's about today." I'm at the point where I don't mention a post to friends or family. If they comment on it in person that is a HUGE bonus now. I've gotten used to being ignored. Stings still, I'll be honest. But not as much as before. Kelly, I really appreciate your thoughts and support! I also barely mention blog or writing things to people who aren't "in it," because it can just be awkward. One great thing that has come out of the problem of not having friend/family support of my writing is that it sort of forced me to connect with other writers online. Because I really don't think I would have stayed with it as long as I have without the support and connections I have made with other bloggers. I think 10 years ago I would have laughed if someone told me I would make online friends, but I really have! There are many women-- including you!-- who I connect with and I'm sure we would have a blast as in-person friends too! It's the exact same for me as well! I've made some wonderful pals online. Hope to meet you IRL some time. I know we'd have a hoot. Here's to continued writing and connecting. I would value any suggestions you might have for my month old blog. AND you must keep it coming Julia, there are people like me so far away from you but reaching out to what you have to say. Thank you so much for taking the time. :)You are an inspiration.You made a mamma really happy today!! I remember reading this one and wanting to comment, and then getting pulled away. I'm sorry I'm so late coming back to this. I think your comment on "risking rejection every day" is spot on. I try to understand that people get busy and get caught up in busy (I'm sure struggling with that right now) but it sure can sting. On the flip side, I also get annoyed with people who are "fake interested" (Oh, how's your business going?) but who have never actually taken the time to look at my work or my writing. And then there's the people are are almost too interested (one family member in particular)... "Oh, what are you doing now! Are you planning to (fill in the blank)? Oh, I don't think you should do that." Maybe I'm just complaining for no good reason, but I'd almost take disinterest over that kind of overly interested! Haha, [nodding head] regarding 'fake interest.' They act all interested but haven't even taken 2 minutes to like your FB page or read one single blog post. Frustrating, especially when it's a close friend! And you are definitely not complaining; I'm glad we are able to support each other!